Okay, I admit it, I’m a boardgame geek and I spend way too much time reading about games on BoardGameGeek.com (BGG). As a card carrying member of BGG for several years now (I registered in December of 2002), I’m slowly amassing what’s called Geek Gold. Now Geek Gold is really kinda silly but for contributing content to the site, you get this stuff and you can then use the stuff to pay for things like a personal avatar image (mine is the Carcassonne tile on the right), a geek badge, an uber-geek badge, games in the auction area etc. After implementing an electronic version of Leo Colovini’s Clans game I had found a BGG Geeklist enumerating free online games that have computer opponents. I wanted to add my game to the list but I hadn’t uploaded a screenshot of my game to the Clans game. So this last weekend I did that and waited for the image to be approved. Today, I got the email that it had been rejected due to it being too similar to other images for Clans. I was shocked! How could the image of my game be too much like other images for Clans? So I jumped out to BGG and looked up Clans and found this image had already been uploaded. I had missed my opportunity to get Geek Gold for my own game since ‘chaosbreaker’ had already uploaded a screenshot. The funniest thing about the whole thing is that chaosbreaker was the author of the geeklist I was trying to add my game to in the first place. Since Sophie wanted to play the 2-person Alhambra, Noah decided he wanted to play Rumis with mom. So Lisa and Noah played in the family room while Sophie and I played at the kitchen table. I wasn’t expecting much but I am surprised at how much I like Alhambra as a 2-person game. The game moves a lot faster and it feels like you’re really in control of your destiny. Neither of us bought any buildings for the phantom player but he did have some pretty lucky draws for Garden, Tower, and Chambers that I was fighting against. Whaddya mean I get no turns! 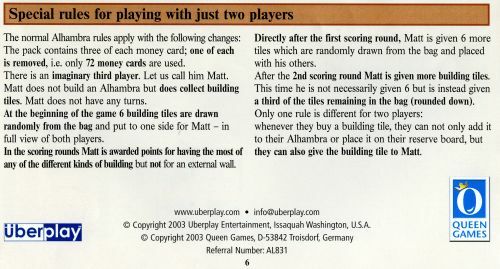 Sophie wanted to learn the two person variant for Alhambra tonight so I broke out the box and started reading the rules and look what I found. Author mattPosted on August 28, 2005 January 27, 2016 Categories All Posts, Board GamesLeave a comment on Whaddya mean I get no turns! 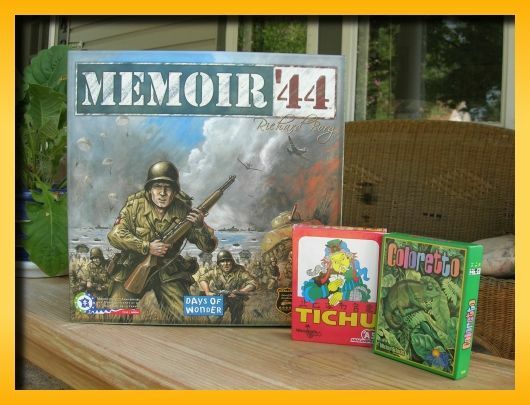 I emailed Days of Wonder concerning some my Memoir ’44 pieces that were malformed. I just received confirmation that they’ll send out replacement parts in the mail today at no charge. Author mattPosted on August 24, 2005 January 27, 2016 Categories All Posts, Board GamesLeave a comment on Thanks DOW! We finally got a chance to play one of my new games this evening. We ran out of time to play a few learning rounds of Memoir ’44 so we broke out Coloretto. I had read through the rules once before hand and we were able to get up and running in about 5 minutes. The game plays very quickly and is extremely light; about in the same league as 6-Nimmt. There are 9 chameleons in 7 colors, some +2 cards and 3 wild cards. Each player starts with a card of a different color face up in their play area. You never hold cards in your hand. In the middle of the table is the draw pile and a row of ‘row indicator’ cards (the same number of cards as players). Each turn a player either draws and lays the card in a row (max 3 cards in the row) or takes all the cards in a row (min 1 card) along with the row indicator card (and sits out the rest of the round). The round progresses until all rows have been taken by the remaining players. The 16th from the last card in the deck is always the ‘end of round’ card (a special card with an arrow on it) and when the last row is taken after this card is drawn, the game ends. At game end you, assign wilds cards to your one or more of your top three colors, compare the number of your top three colors of matching chameleons against the ‘point chart’ (plus any +2 cards) to arrive at your score. You then take the non-highest colored chameleons and substract the points shown by the point chart to then arrive at your final score. The player with the most points after four games is the winner. Ties remain just that…ties. We liked the game but I suspect it will only see the table during road trips and things like that but it does provide some semi-mindless fun. I got my new game fix again on Friday. Rich was putting in an order and I dropped in a few more titles. I normally order from Game Surplus but Thought Hammer offers free shipping on orders over $100 so we went with them. I’ll still go back to Game Surplus for orders less than $100 but I was satisfied with the price and service of Thought Hammer. I ordered Memoir ’44 to provide a heavier weight 2-person game. The game plays like a light game but my hope is that it feels heavier than most 2-player games like Balloon Cup, Battle Line, etc. My covert reason (although not now) is that it might entice my game group to feel better about breaking into two tables and to reduce the “I’m sitting at the kiddie table” feeling. I bought Coloretto and Tichu as filler/closer games that will also be nice to take on trips. 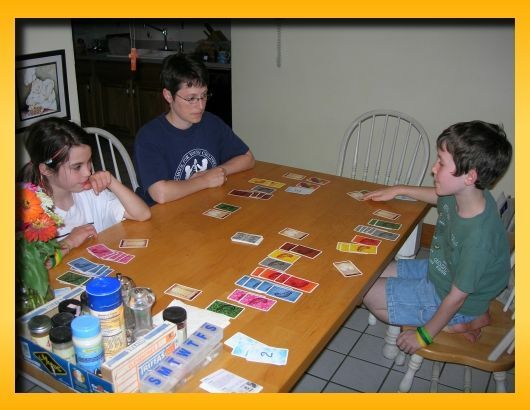 Both games are easy to learn with the added benefit of appealing to more non-gamer types since they are more familiar with card-based ‘family’ games. Tichu also supports up to 10 players so it will scale well when you get done playing a round and the additional cousin or in-law is wanting to jump in. If you have any thoughts or words of wisdom about my purchases, feel free to comment. My missing parts for Power Grid showed up in the mail today. Thanks Jay! I’m now fully stocked on coal and I have a full load of trash. 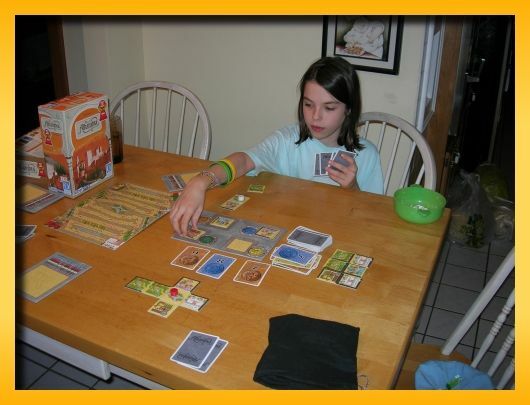 In Bohnanza you cannot harvest a bean field that has only one bean it if any other bean fields you own have more than one bean in it. The purpose of this rule is, I’m assuming, to make it more painful for you to get stuck with a bad case of stink. 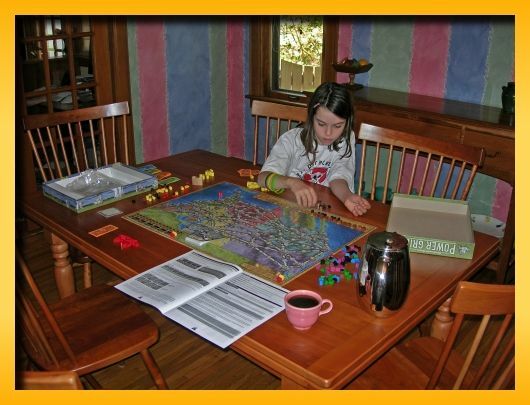 Sophie and Noah helped me work through the rules to Power Grid. I’m very proud of them in that they ‘suffered’ through it willingly and had fun in the end. We only got to play a few rounds over the course of the 2 hours we worked through the steps (!) but in the end we all thought we’d like it. The game is listed for ages 12+ but I’m convinced they can play it. I really wish they would have told us what “steps” meant before they started using it in the rules though. That would have made things a lot more understandable. Anyway, I think I’m in a much better position to teach the game but I think I’ll give it a few more test runs and then some reading on the BGG to understand the common pitfalls. Anyway, thanks Sophie and Noah for helping me out. 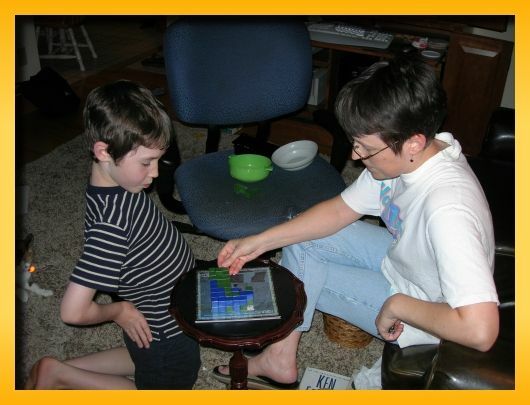 I taught Lisa and the kids Bohnanza – The Bean Game this evening. 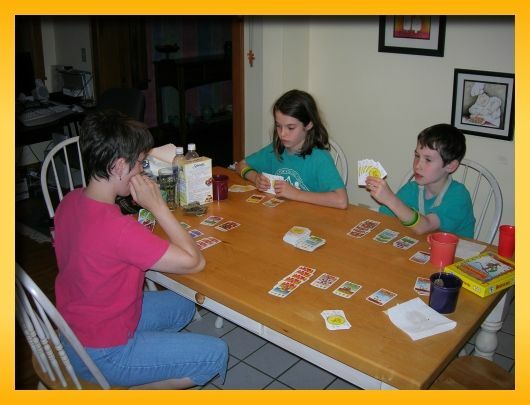 The game requires drawing, trading, and donating cards containing one of eleven varieties of garden beans from your hand. Although simple in concept, it actually stresses the mind a bit to manage what beans to harvest and plant in your fields. The most unique part of this card game is that you are never allowed to rearrange cards in your hand. When it’s your turn to play (you become the active player) you must always play from one end of your hand and replentish cards from the other end of your hand. At each turn, all players may adjust this converyor belt of cards moving towards the playable end of your hand by trading and donating cards (in any order) to the active player. In this fashion you can get rid of cards in the middle of your hand so that the cards you want arrive at the playable end of your hand when you become the active player. I’ve owned the game for almost two years but have never played it with my family since I thought the kids would find the concepts too hard to grasp. After recently successfully teaching the kids Amazonas, a game I also thought would be too complex, I decided to give Bohnanza a try. Unlike some other games, this one proved to be easy to teach but required a lot of coaching throughout the game to illuminate why you might or might not want to trade and what might make a good offer to another player. Overall it was a successful night in that the kids and Lisa enjoyed it and we got to do something together as a family for the entire evening…always a good thing. In the end, the kids said, “I like that game!” We must have done something right. 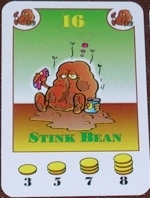 Author mattPosted on August 5, 2005 January 27, 2016 Categories All Posts, Board GamesLeave a comment on Stink Beans!